Ever since I made the Knit Half Fisherman’s Rib Headband, I have had several requests to make a crochet headband. Initially I planned to share this headband along with ANOTHER headband. Yes, I was going to hit you with TWO pretty headbands! Alas, the other one was a failure. I almost took a picture to show you how pretty it was, but it just didn’t fit right. I’m going to use the stitch pattern for something else, so I will hold off on posting a picture for now. 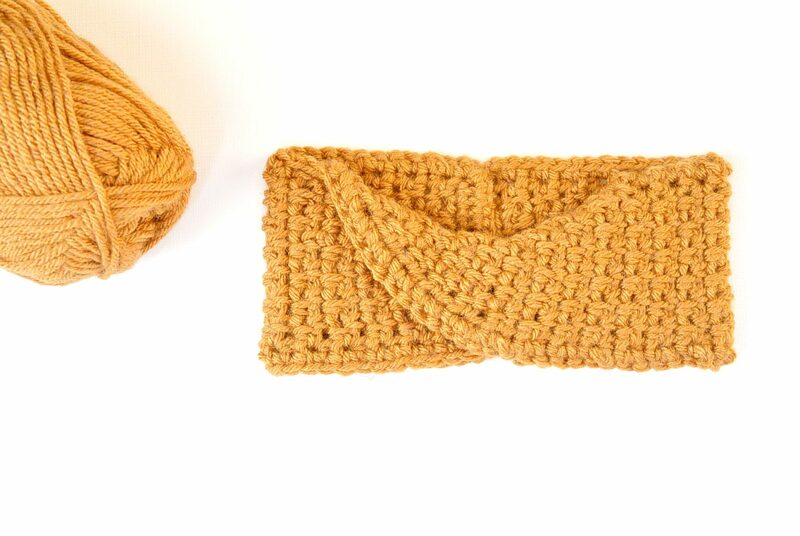 😉 So here’s the headband that worked out well and it’s done in my current favorite crochet stitch right now the moss stitch ( Same stitch used for this and this ). 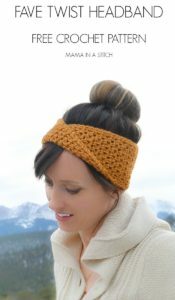 I’m really loving this headband (it might be a fave) and the color goes with so many different outfits. 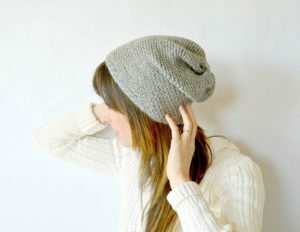 These are great to wear because they hide messy hair and keep you cozy at the same time! 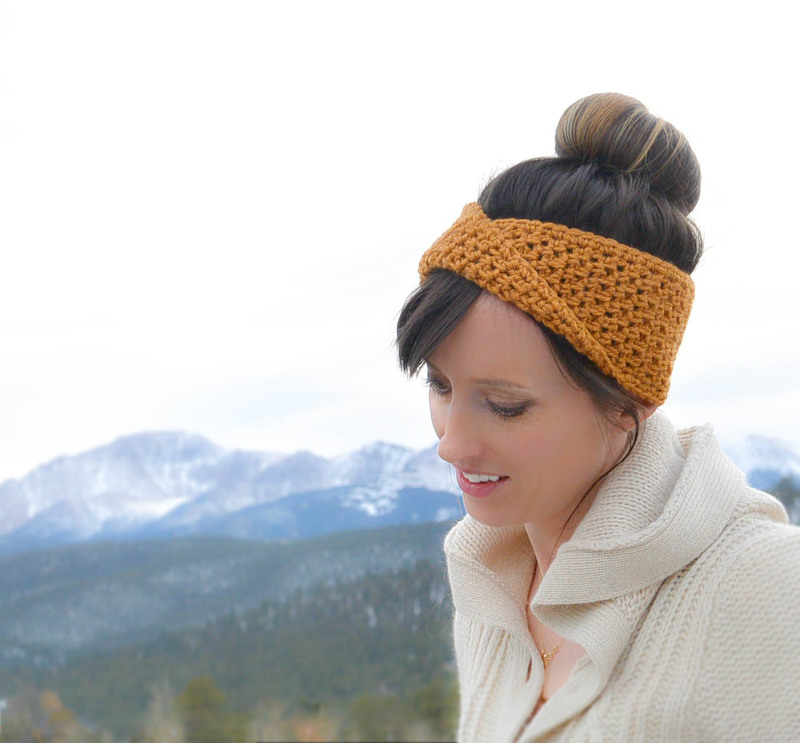 If you are a total beginner, you can certainly just single crochet this entire headband. You will get a similar look! Chain 15 and single crochet each row until you have the length you need to fit your head nicely. You need to know how to single crochet and chain stitch for this pattern. 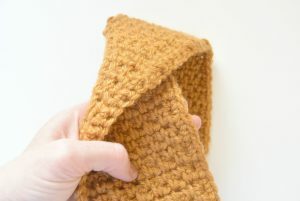 You are essentially crocheting a big long rectangle that you will then twist and seam together. If you need more help, see my post here where I included a link to a video tutorial on how to work this stitch. There’s the initial chain. This is how wide the headband will be. Now you will work the crochet pattern until you reach the length that fits around your head. EASY PEASY!! The fabric is reversible making it perfect for this “twist” headband. Just fold it over as pictured. Once piece reaches desired length, you will then single crochet around entire piece. Holding your long rectangular piece, twist it once and join ends. Seam ends together with your preferred method. A whip stitch is just fine. Weave in your ends. ***This post contains affiliate links which means I may be compensated if you make a purchase through the links on this page. -5 is bitter cold indeed. That is SOOO COLD. Oh my goodness…I know! The leather seats in my car just FREEZE me every time I get in this time of year. Hope it warms up a bit for you soon. 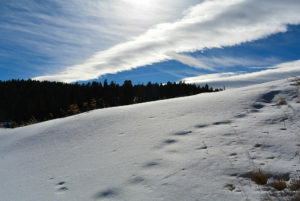 We are supposed to have some flurries tomorrow, but nothing bad. Hola! Acá el clima está bien. Frio para el estándar de California, pero sin quejas después de leer tu blog. Saludos y gracias por el patrón. Hola Silvia! Hace el calor muy extrano este ano! De nada Silvia. Thanks for stopping by. I’m dropping by your site now! It is cute, but didn’t work for me. It got wider after the CO.
Hmmm.. Sorry for the frustration! I wonder what could have happened. Did you watch the video on how to do the stitch? Sometimes people forget to make the single crochet in the last stitch rather than a chain and sc, which would make it wider. I hope maybe this helps! This is such a great pattern, thanks for putting up in your blog. My daughter and her husband live in Wisconsin and it’s definitely Cold there this time of the year. I think that I’ll make a couple for them. Nothing says that a guy can’t wear one. You’re welcome and you’re right! Nothing says that a guy can’t wear one. 😉 I’m so glad you like the pattern. I would imagine it is cold indeed in Wisconsin this time of year. How nice of you to think of making your daughter and son in law something to keep them warm. 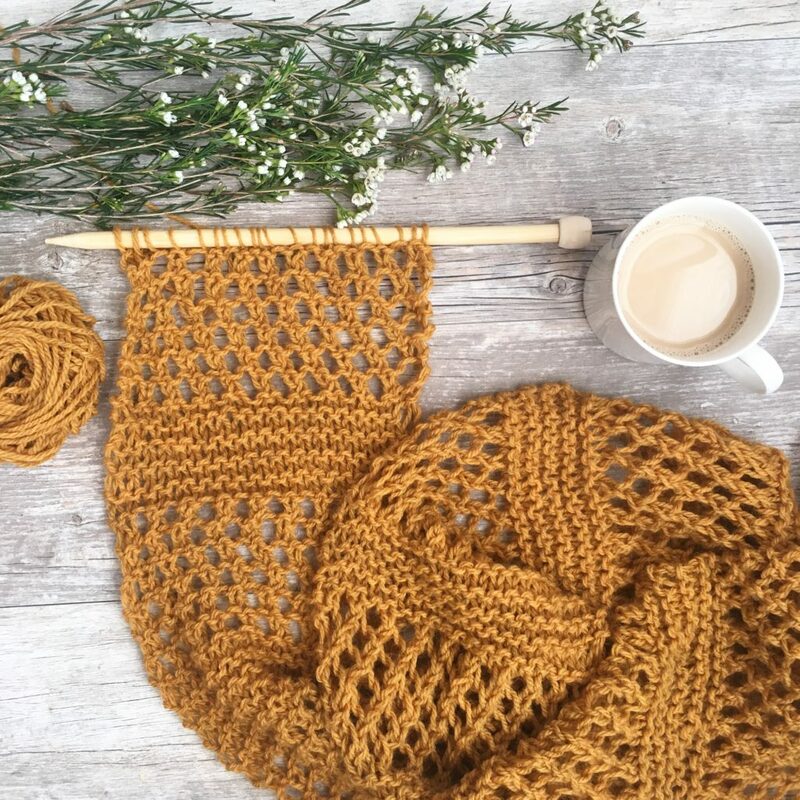 What a great pattern – I can’t wait to make it! Thanks for sharing! 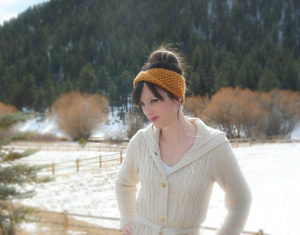 Thank you so VERY much for making your “Golden Fave Twist Headband” pattern for crochet. It is so cute and stylish. I am making it this week using reflective yarn so I can wear it to walk and be safe! I can’t wait to finish it! OH I like a lot!!!!! Thank you. Do you need to skip a stirch after you chain one? Because it I do it the way the pattern says it keeps getting wider and wider. It keeps doubles every stitch. Yes, you skip the stitch underneath. Hope that helps! When I started to make this it was curving instead of staying straight. Any suggestions? Hmmm, I really don’t know what might be causing it to curve. It should be a flat piece. 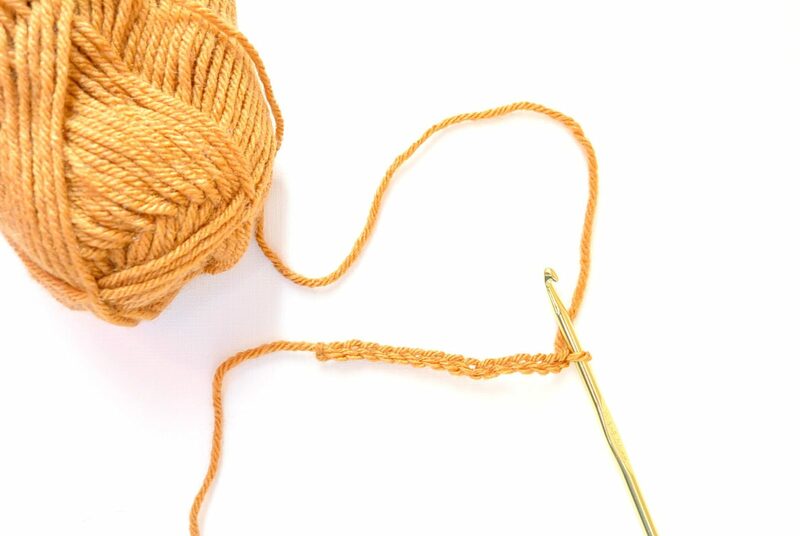 Are you making sure to skip the stitch below and you’re making your ch. 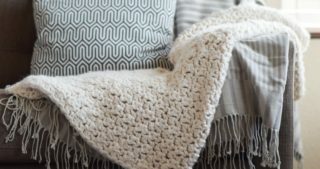 stitch after your single crochet stitches? I’m just wondering if there could be some decreasing happening that’s causing it to curve. Maybe someone else that comes by the blog might have an idea. Sorry I’m not more of a help with this! 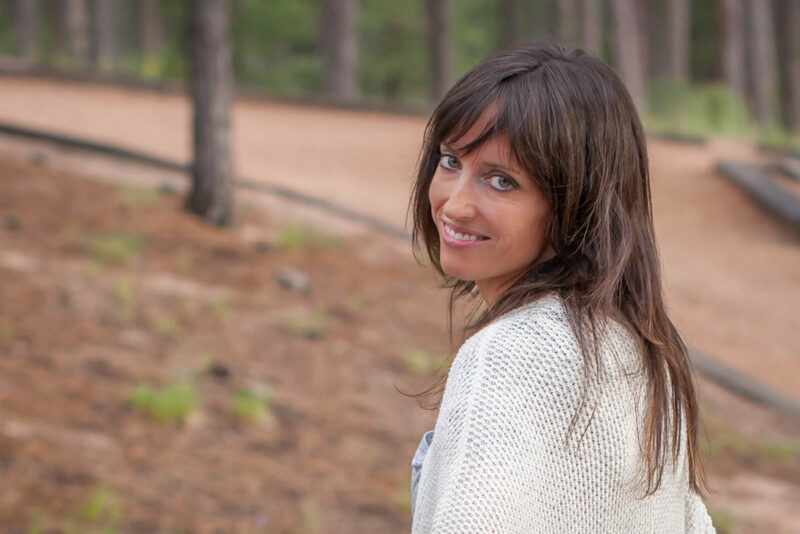 Hi Jessica, I read the comments and I was having the same issue. So, I followed the link to the next pattern and to the video and watched it, and you do indeed skip a stitch, but your written pattern does not say to skip a stitch. 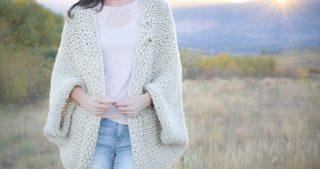 Maybe you need to re-read your pattern and fix the mistake… I do love the look of it and will be trying it out with skipping the chain as the video says. Thanks for the great suggestion Jessica! 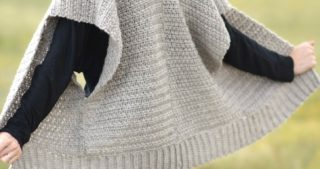 Although I have a link to the tutorial, I want the written pattern to be crystal clear and I didn’t include the “skip stitch” in the pattern. I assumed that folks would know when I say to sc into chain below it would make sense. But this is so much better and will hopefully be a help to others. I’ve corrected the pattern above. Thanks again and have a great night! For some reason when I click on the link for video it takes me to another pattern. It’s just available to view here on the blog. Thank you!